Join us for a fusion of great Chilterns artists on a site of outstanding natural beauty at the historic Chiltern Open Air Museum. Watch close-up as professional artists demonstrate live. Meet and chat with them and watch them in action. Find inspiration and learn new techniques for your own work. 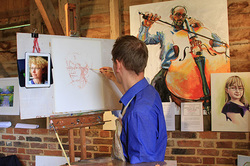 Come and paint on site "Plein Air" and soak up the festival atmosphere on our village green, bring a picnic and blanket! Activities and fun for all the family with Art in the Barn at the Creation Factory.